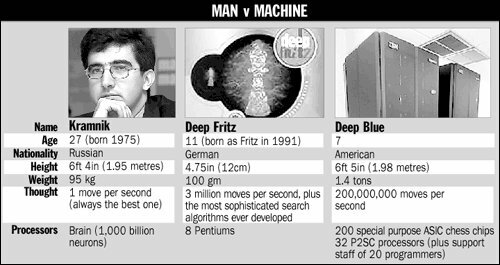 Man bytes Machine… will Kramnik Prevail? ChessBase.com noted a very interesting article from U.S. News magazine on the pending human-computer matches involving two of the strongest players… GM Garry Kasparov and GM Vladimir Kramnik. As we know, much has been said over the years about chess-playing programs becoming so strong that they have eclipsed the abilities of the strongest players. Perhaps this isn't true… not just yet. In 1997, GM Garry Kasparov (in his prime) lost to Deep Blue sending the message around the world (including among non-chess players) that humans were finished. Of course, many of us who followed the match know that the conditions were suspect as the world champion was not given the database of Deep Blue's games to study while the silicon monster had every single move that Kasparov had ever played… or thought of! Kasparov psychologically cracked under pressure, resigned in a drawn position in game #2 and humiliated in 19 moves in game #6, the match finalé. However, even if Kasparov had been victorious (as he was in the first two matches), would that have changed the notion that computers/computer programs have somehow caught up? Probably not. There have been a series of recent matches pitting computers against humans… computers have recently dominated. What do these matches really mean? To some, there is a deep scientific intrigue… to others, it is perhaps overemphasized. To put this in prospective, one may recall a comment made by Deep Blue-Kasparov match commentator GM Maurice Ashley in a 1997 National Public Radio (NPR) interview shortly after the match. When asked about the result, GM Ashley replied, "So what. Soooo what. If we build a robot that can outdunk Michael Jordan, is that really what we want to see?" Ashley went on to talk about the inherent beauty in chess competition which combines intense skill, grit and determination, body language and emotion (even human imperfection) … all in the heat of battle. "That's what we play chess for," says GM Ashley adding on the point with emphasis. Despite this incisive point, there seems to be (and perhaps always will be) a bit of mystery to man vs. machine battles. "I have to change my way of playing from normal chess. What matters is to develop the most unusual tactics possible. I have to keep the computer from using its calculating skills. And I will do this while provoking moves that it doesn't understand. The machine has to feel uncomfortable, so to speak. Computers are just street muggers. The love to grab pieces whenever there is a chance to do so. I wouldn't have the slightest chance in a fast game. A computer isn't capable, in the same way a human is, to put knowledge into context. Intuition is a gift that is totally foreign to a machine and where problems can arise for it. Sometimes I just have a gut feeling which move I must make. I just feel it - and my feelings have rarely let me down." Read Nell Boyce's article from U.S. News, "Chips vs. the Chess Masters." 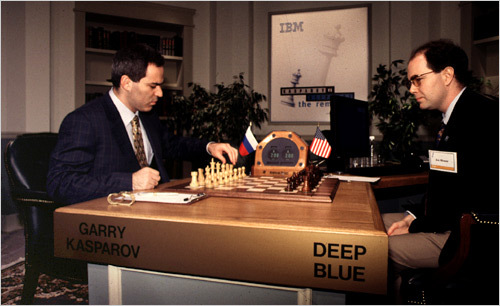 Deep Blue vs. Kasparov, 1997 (IBM Research page). Includes game commentary by IM (now GM) Maurice Ashley, GM Ron Henley, and GM Yasser Seraiwan.